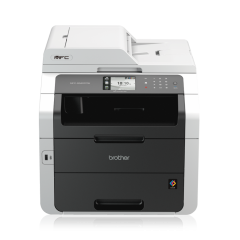 The Brother ADS-3600W desktop document scanner is simple to set up, robust for continued office use and reliable for uninterrupted professional scanning of vital documents. Offering true network capability, business critical information can be sent directly to a desired Network folder location, improving workflow efficiency and increasing productivity. Scan instantly at the touch of a button, with programmable scan destinations on the 9.3cm colour touchscreen. This powerful scanner also comes complete with a SuperSpeed 3.0 USB connection for fast data transfer. Are you looking for a desktop scanner that supports wired and wireless network? You will find exactly what you need and more from the Brother ADS-3600W Scanner. It allows you to scan documents via the network, eliminating the need to login to a computer or install software. With a scan speed of up to 50ppm, scanning time is significantly reduced while productivity is increased. For its desktop size, this machine packs a range of features – scan to email capabilities, Multifeed Detection that identifies potential misfeeds and automatically suspends scanning, and Advanced Reverse Roller system that ensures only one page is processed at a time. Aside from wireless and Ethernet connection, access to the scanner is also available through USB 3.0.